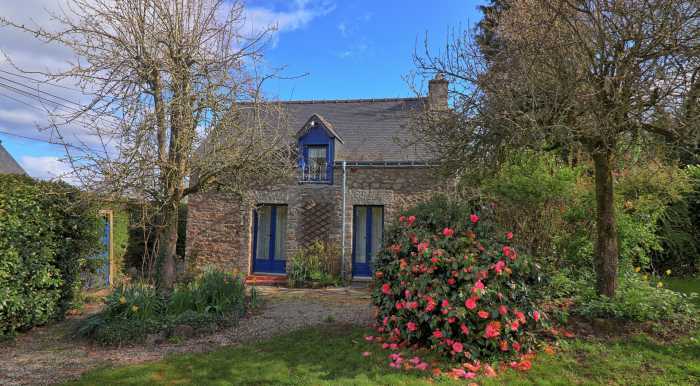 Just outside of the pleasant village of Kergrist, about 10mns drive north of the ever-popular town of Pontivy, is the fabulous stone cottage sitting in 1/8th of an acre of garden. The house dates back to around 1900 and was renovated 10 years ago. It now offers you a bright and airy living room / diner with beamed ceiling and fireplace and two lots of French doors out onto the garden, then to the rear of the property you have a fitted kitchen, downstairs shower room with toilet, a boot room/laundry with back entrance from the gravelled patio area. Upstairs you have a large open plan bedroom, a small single bedroom which is ideal for a child or an "unexpected guest", as well as a bathroom with toilet. Garden is very private and a sun trap! Town centre, Movies. Shops, Primary school, Middle school. Golf. Hospital/clinic, Doctor, Sea. Public pool. Supermarket.